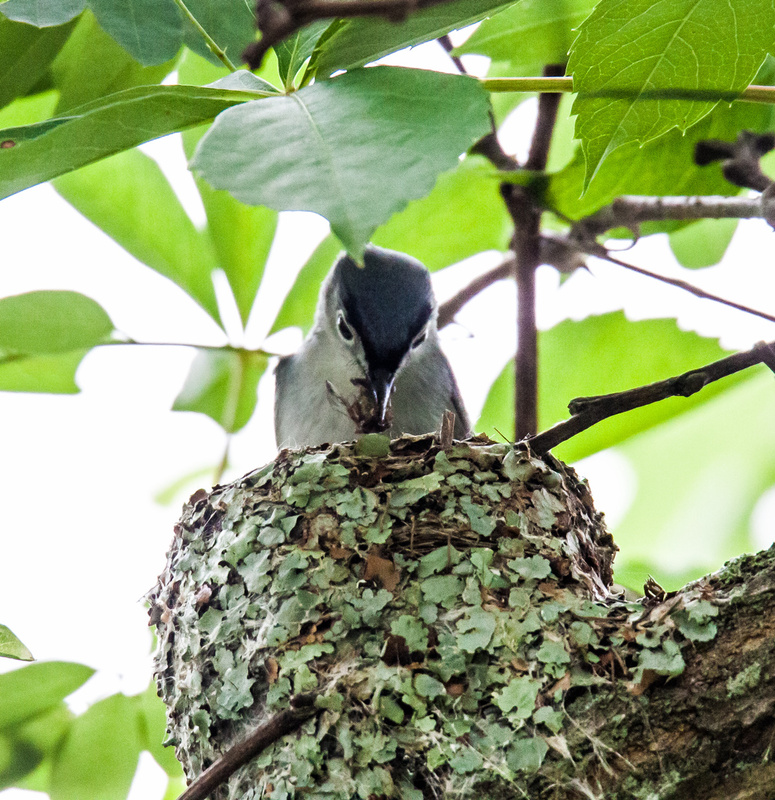 I don’t know for sure if there were babies in this nest on Monday, but this adult Blue-gray Gnatcatcher (Polioptila caerulea) kept bending forward into the nest, including the moment in the first image when it had what looked to be an insect in its mouth. Was it feeding some young ones? I have seen numerous photos this spring of baby birds with wide open mouths and I have been longing to capture some images like that. 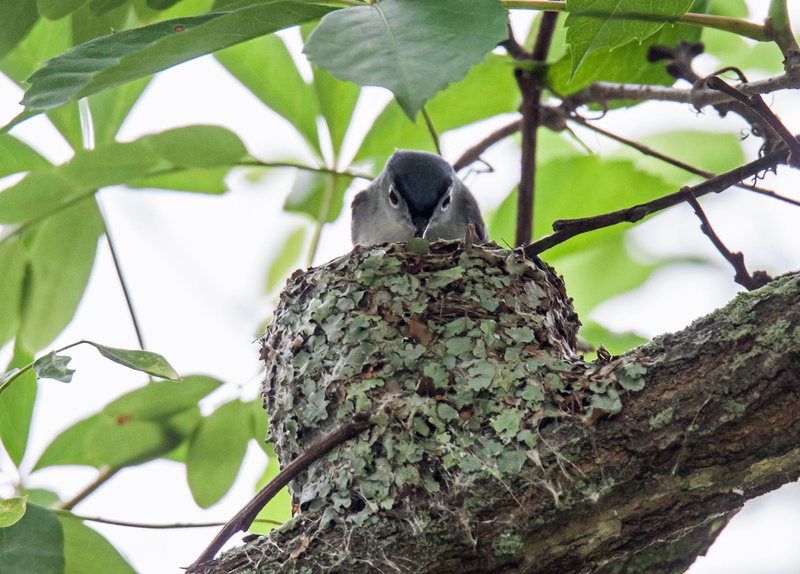 Several weeks ago I watched as two gnatcatchers worked on this nest at Jackson Miles Abbott Wetland Refuge here in Northern Virginia. I marveled at their patience and at their amazing craftsmanship. They would bring small bits of material into the nest (spider webs and lichen from what I have read) and place them carefully. Then they would rotate their bodies while sitting in the nest to compact the material. It was a bit of a challenge to capture these shots. I was shooting upwards and there was a leafy canopy that filtered out a lot of the light. I also tried really hard not to disturb the birds, so I kept my distance, avoided using flash, and limited the time that I was shooting. Are there babies in the nest? If they are not there now, they should be coming soon. 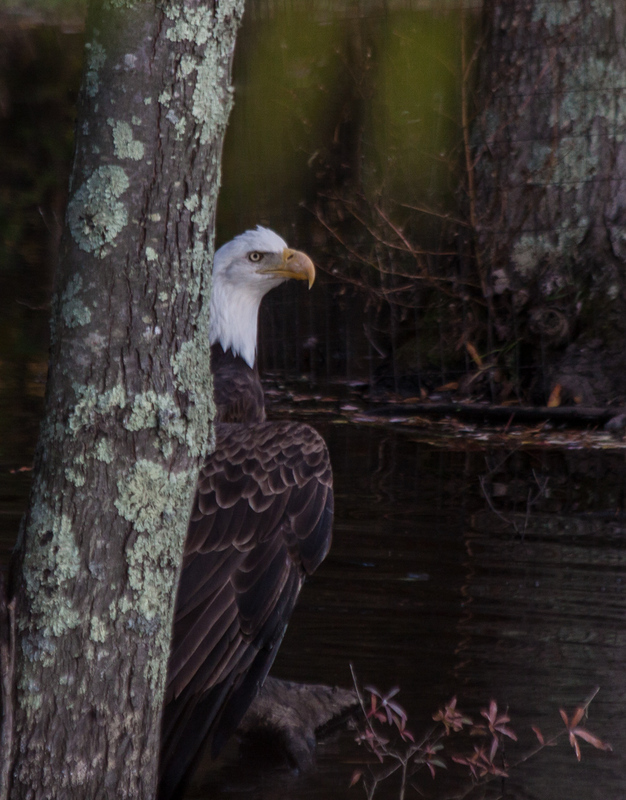 I will be sure to check out the nest when I return to this little wetland refuge some time in the near future and maybe then I will be able to capture shots of the little ones being fed. Blue Dasher dragonflies (Pachydiplax longipennis) are one of the most common and widespread dragonfly species in my area. You can get so used to their presence that you stop paying attention to them, which I think is a mistake, for in doing so you will miss their amazing beauty. 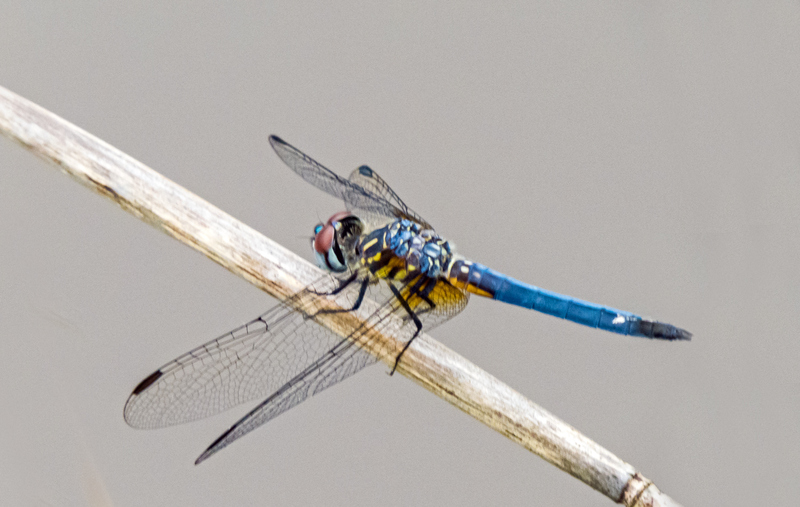 The colors and patterns of this little dragonfly are stunning. 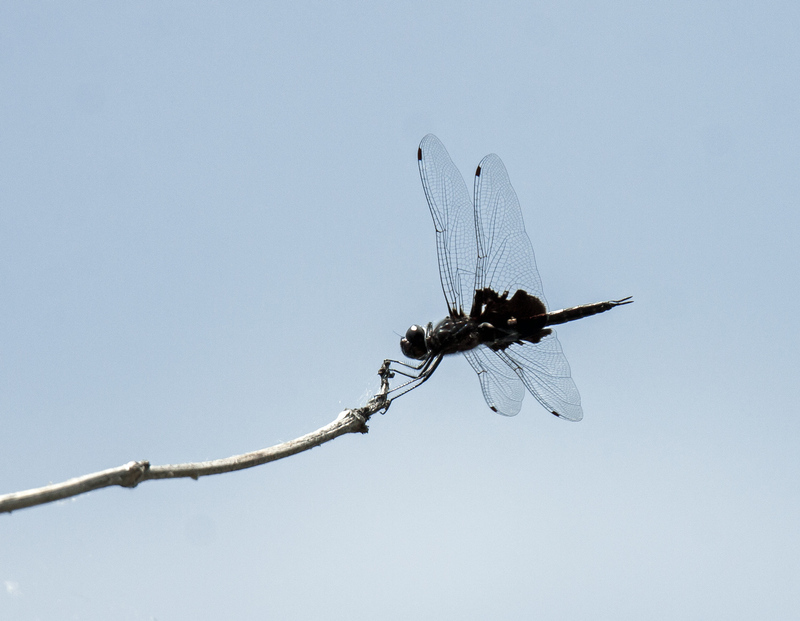 In case you are curious, the Blue Dasher in the first shot looks to be a female and the one in the second image appears to be an immature male. When I flushed this damselfly yesterday at Jackson Miles Abbott Wetland Refuge, I was immediately struck by the length of its body—it seemed to be really long and skinny. The spreadwing family is not all that big, but I still had trouble identifying the species of the damselfly. As is usually the case in this kind ofsituation, I turned to my local expert, fellow dragonfly enthusiast and blogger Walter Sanford, who identified it as a female Slender Spreadwing damselfly (Lestes rectangularis). 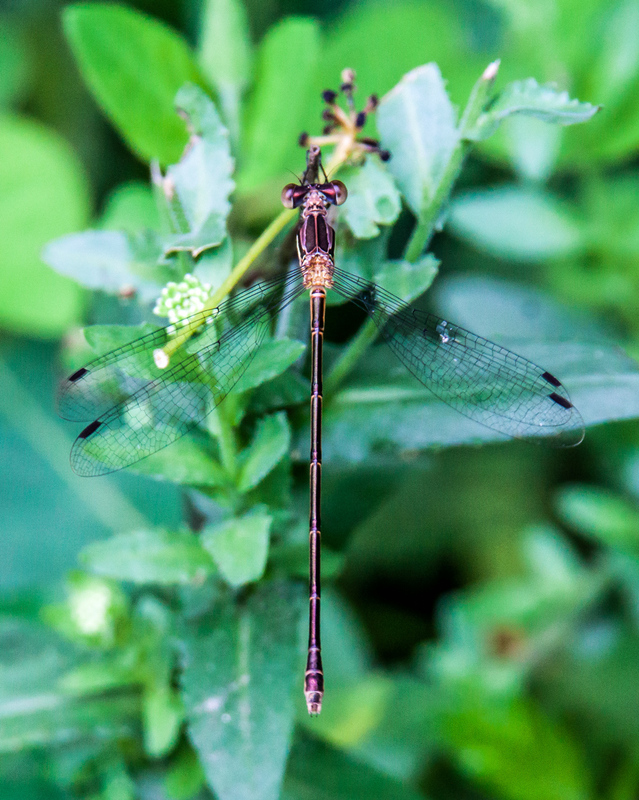 I sometimes complain about the inappropriateness of the names of species, but in this case “slender spreadwing” is a perfect match for the subject that I observed. 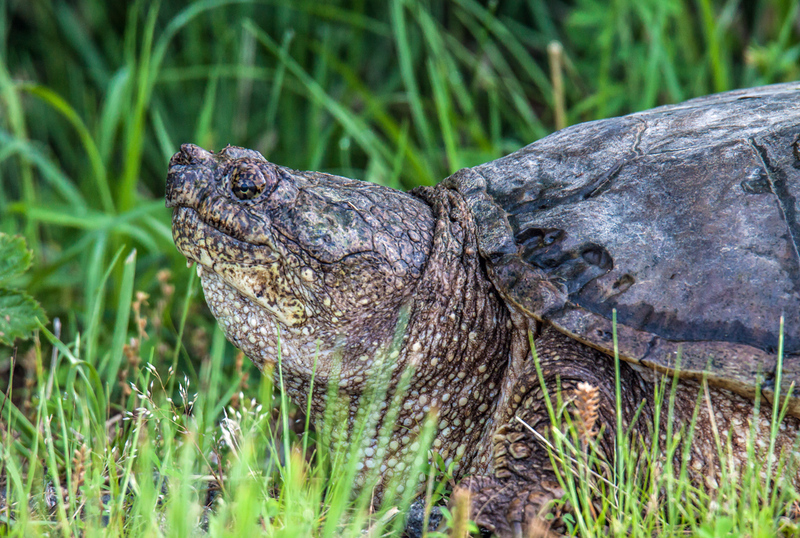 In case you are curious about the photo, I shot it with my Tamron 150-600mm telephoto zoom lens on my Canon 50D DSLR. Over the winter I have become accustomed to using a monopod for stability and for this shot, I lowered the monopod and shot while kneeling. One of the limitations of the lens is that the minimum focusing distance is almost 9 feet (274 cm). At that distance, the camera’s autofocus system had trouble locking on the slender body of the damselfly—it kept focusing on the vegetation—so I resorted to manual focusing. 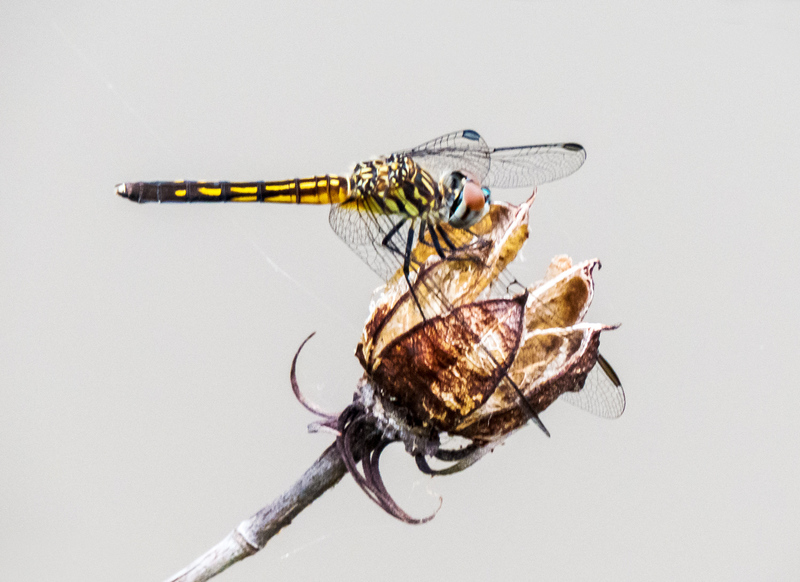 Most people are more familiar with dragonflies than with damselflies, but I encourage you to slow down and search for beautiful damselflies, the smaller members (in most cases) of the order of Odonata to which dragonflies also belong. I was prompted this morning to read again the challenges to all Americans found in Abraham Lincoln’s Gettysburg Address, challenges that seem so appropriate and relevant as we pause in the United States on this Memorial Day to remember the sacrifices of so many brave men and women. Those patches somehow remind me of the famous inkblots of the Rorschach test. I suspect that. if asked, people have widely varying ideas about what they look like, though I know that I personally would not want to have any psychological interpretations attributed to my perceptions or to my imagination. 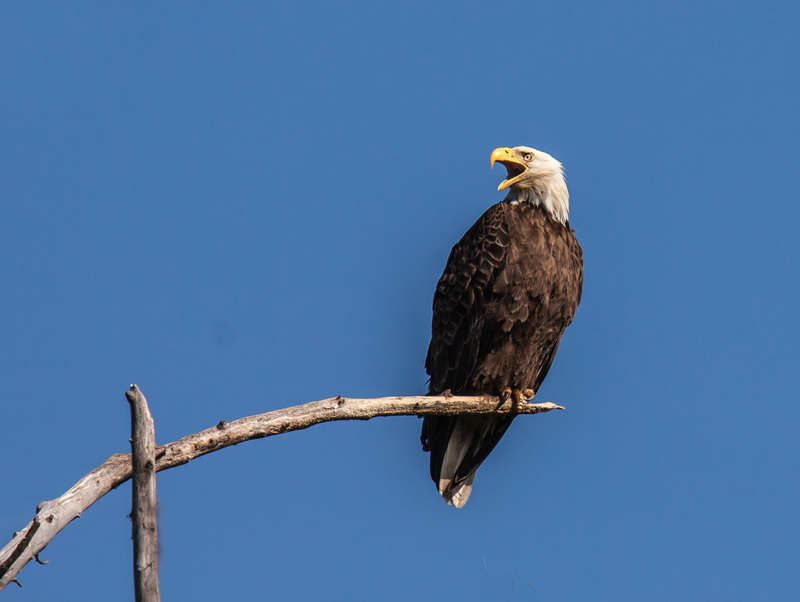 This Bald Eagle (Haliaeetus leucocephalus) couldn’t seem to decide if it wanted to yawn or scream this past Monday at Occoquan Bay National Wildlife Refuge. Either reaction could have been a response to my presence.